When it comes to dealing with corrosive chemicals, the equipment you use can really take a beating. If it isn’t constructed using the proper materials and safeguards, corrosion can happen quickly and have a serious affect on your bottom line. It’s also possible that the corrosive chemicals you handle are flammable. The presence of hydrofluoric, sulfuric, and muriatic acids; 1,3-Butadiene; carbon monoxide; ethyl chloride; methyl bromide or chloride Ð even gasoline can corrode your equipment while posing a serious safety hazard to employees. The Department of Labor’s Occupational Safety and Hazard Administration has created a classification system that helps determine the risks associated with various hazardous environments and guidelines for the equipment used therein. The National Electric Code (NEC) breaks classified hazard locations into three classes, each with special properties. ArlynGuard B scales are our line of intrinsically safe bench scales. Capacities range from five pounds with a resolution of .001 to 150 pounds with a .05 pound resolution. ArlynGuard C features our intrinsically safe cylinder scales. Perfect for weighing drums of corrosive, flammable materials, they are available in 60, 300, 400 pound capacities or higher. Resolutions are .02, .1, .1 lb respectively. 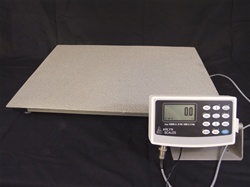 ArlynGuard P platform scales are available in a five hundred pound capacity with a resolution of 0.1lb and a 1,000 pound capacity with a resolution of 0.2lb. There are a wide variety of platform sizes to ensure that they integrate with your existing work floor design flawlessly. ArlynGuard F features our line of industrial strength, intrinsically safe floor scales. The smallest capacity is 2,500 pounds with a half pound resolution. The largest capacity is 20,000 pounds with a five pound resolution. However, higher capacities are available upon request. With an internal readability of one part in 500,000, these scales include features found on scales that cost five times our price. With no set up or dealer services required, they are easy to operate and provide an extremely long battery life from a single, rechargeable C cell battery. Other features include an easy to read graphics LCD display, full numeric keypad, an intuitive menu driven interface, and large memory capacity. An optional infared communications interface allows communication with non-hazardous areas without cabling or barrier strips and offer RS-232, analog, and setpoint outputs. No matter which line of scales you choose from, you will enjoy an increased useful life for your nonincendive equipment. We start internally with stainless steel load cells. The powerhouse of any scale, load cells are the devices that measure the objects you place on your scale. Stainless steel provides additional strength, accuracy, and corrosion resistance Ð even the in the face of corrosive gasses that is unparalleled in our industry. We also provide stainless steel platforms (and full stainless steel construction upon request) to ensure that your scale is safe in any situation. Whether yo are dealing with a leaky drum or measuring raw material, contact with these corrosive agents will not affect the performance of your scale. If your materials are especially corrosive and harsh, we also offer a garnet infused triple epoxy coating for your scale’s platform. This epoxy provides additional protection from the scratches, scrapes, and abrasions inherent in an industrial setting. Unlike the enamel paint our competitors use, which provides no protection once it’s scratched, our epoxy prevents corrosion from affecting the scale and spreading to other areas of the platform or to the internal components of the scale, where it affects the accuracy of your equipment. Arlyn Scales is a factory direct manufacturer of weighing equipment and has been doing this for 35 years now. This means that we are responsible for all of our scales, their sub-assemblies including load cell design, microprocessor instrumentation, and accompanying computer software. It also means we are in a unique position to provide extremely competitive pricing and unparalleled customer service. If you have any questions regarding the corrosive, flammable materials you handle everyday, contact us today. We can discuss your needs and your concerns to ensure that you get the exact scale you need to keep you measurements accurate and your work force safe. We are a US-based company and operate out of Long Island, New York, which means our lead times are fast and our shipping costs are low.